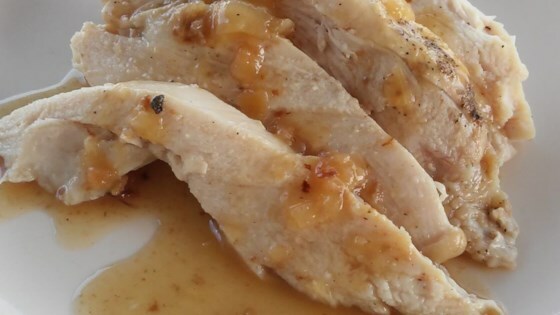 "The Instant Pot® made the moistest turkey breast I have ever made. I usually let this cook in the slow cooker all day, but this turned out so much better. I couldn't believe that I had such a wonderful meal ready in less than an hour total!" Sprinkle onion soup mix all over turkey breast and place in the pot of an electric pressure cooker (such as Instant Pot(R)). Place celery and onion chunks over and around turkey breast. Pour chicken broth over turkey breast. Seal pressure cooker and bring to high/low pressure on the 'Poultry' setting or according to manufacturer's instructions; cook until juices run clear, about 30 minutes. Release pressure through natural-release method for about 20 minutes. Transfer turkey breast to a plate and slice. Change the electric pressure cooker setting to 'Saute.' Mix water and cornstarch together in a bowl; add a small amount of hot liquid from the pot. Mix until dissolved; pour into the pot and whisk well until thickened, about 3 minutes. Serve gravy alongside turkey. really good I just needed more time on my pressure cooker xl. Next time will use the medium 30 minute button instead of the white quick button. This was by far the best and moist turkey recipe I have ever had! It's truly a new favorite of mine. Definitely will make it again!